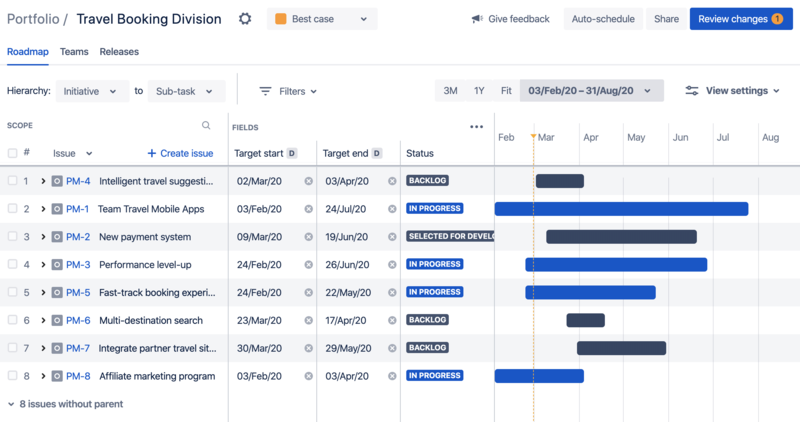 issue details that Portfolio for Jira accesses from Jira, like assignees, issue statuses, sprints, releases, dependencies, and more. any custom fields existing in Portfolio, like target start dates, target end dates, and teams. any custom fields configured in Jira, like single-line text fields and single-choice select fields. See Configuring plans to learn more about adding custom fields. To display issue details in a plan, you'll first need to add the relevant fields to the plan. These fields will be displayed as columns, and each field will contain the corresponding issue detail. In the fields section of the plan, click more ( ) > select the checkbox of the field you want to add. Setting a value for a field Click the cell of the relevant field, then specify the corresponding value for it. In the fields section of the plan, click more ( ) > clear the checkbox of the field you want to remove from the plan. The order of the columns in the fields section depends on the order that you add the fields to the plan. We're currently iterating on the best way to reorder fields for future versions. In the fields section of the plan, click more ( ) > clear the checkboxes of all the fields. To make the fields display the details you need, resize a field by dragging either end of its corresponding column. If you resize a column and make it small enough, the column automatically collapses. Click the column name to expand it. To quickly collapse and expand a field, click its corresponding column header. To collapse all fields, click Fields in the fields section itself.